What to do with a tree. We have a tree in our garden that is simply too big. Other than using it for a spare wheel as they do in Russia, I would like to prune it. It's a birch tree and doesn't seem to be the sort you can pollard. Anyone tried pruning this sort of tree? If so what happened in the spring? Did it grow back? Re: What to do with a tree. About 25 years ago our neighbours of the time thought it would be nice to plant a birch in their small (15 ft wide by 10 ft deep) front garden, right next to the dividing line between the two properties. If left to its own devices it would now be larger than yours I expect. Around 15 years ago, with their consent and help I cut the main trunk off at about 12 ft above ground level. I can still see the cut stump about 3 inches diameter. The tree still flourishes, the side branches grew upwards as they do for birch, and the overall height is now nearer 18 ft. It was a daft choice for such a small front garden as although they will survive pruning they are never going to look attractive afterwards IMO. Personally, and I hate to say it, I'd lop it. It is, sadly, the wrong tree for the location - and it's got some growing to do yet. We've 3 at the end of our garden and they're stunning. The tallest is around 30ft I'd guess. I love the sound of the wind through the leaves. I take the newer, lower shoots/branches out each year, just to keep the canopy up, but other than that I just let them go. But then we have the space for them. The trunk would make a nice pedestal for a bird bath. The canopy's not that dense and doesn't cast much shade and lopping off limbs seems to do them no harm. If you want height in a small garden, I don't think these are that bad a choice. You can pollard them. I've seen it done. Birch are quick growing and relatively short lived. They are also susceptible to disease so if you do lop bits off treat it well. Birch usually regrows OK after pruning,, unless it's an old tree. I've coppiced many, some which were twice as old as yours, and they regrew the following spring. It looks as though yours was pollarded at quite a low level about a decade ago. I'm not sure about treating the cut end(s). A protective treatment musn't inhibit fresh growth. In woodland we usually just make sure that the ends have enough that water drains off without forming pools. Our willow was lopped pretty savagely a couple of years back as a preliminary to removing it completely - nothing but the trunk left standing - then we changed our minds. It's as beautiful as ever now. We didn't treat the cut ends but it didn't seem to matter. Had one in the garden of my child hood home and it grew to a good 50 odd feet and had to be felled due to a disease. Totally unsuitable for a small garden and one was recently taken out from a very small front garden as it was over shadowing the house. And around the corner another one was taken out for the same reason. They are not small garden trees. Most species of willow are nearly impossible to kill without chemicals. Birch is not as robust. 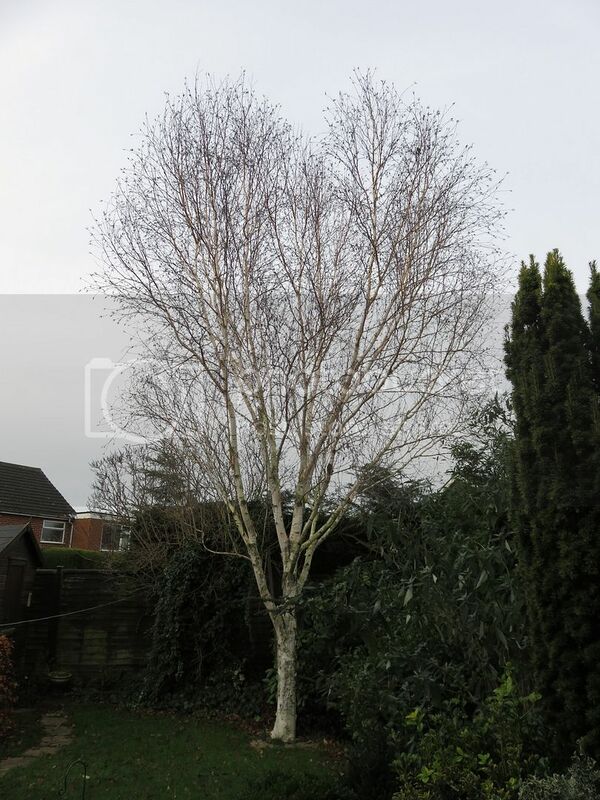 Birch makes an excellent tree for a medium size rural garden. The dappled shade in summer is a good place for picnics with young children. I tend to work on a smaller scale as a bonsai-ist, my largest being a 4-hander at about 1.2m tall and wide. The general principal if you are cutting for new growth would be to leave a small shoulder, cut face toward the prevailing sun if possible and leave it in a direction that will allow rain to shed. Once new shoots have established you can tidy up the shoulder you left behind. I've doen that with most species (pines are a bit special) but no real success with birches, I've always found them too apically dominant and wanting to go tall and slim rather than low and bushy. With that in mind I could see pollarding work. Thanks everyone. The tree has now been lopped. It seems a shame but it was simply too large and just keeps growing (we were sold it as a tree with a 17' maximum height and it was well over 20'). It was a good opportunity to meet the new neighbours who seemed very keen to help.. We'll see how it does! About 20 years ago my dad decided to buy each of his offspring a tree to remember him by when he died (as if we'd ever forget ). He chose walnuts and was assured that they were dwarf stock. 17 years later, when the tree was now over 20' tall and its trunk was about 17" in diameter 12" above the ground, Dez got to work on it, with my help. He climbed the ladder and operated the hand-saw. I pulled the rope to make each branch fall in the correct direction. Once all that was left was the trunk, he dug a huge hole and sawed each of the main roots off well below ground level. The trouble is that when you are told that the tree is dwarf stock, there's no taking it back to complain when it proves not to be. So no one can see! Are some of the words of a song I sang in Junior School. This thread really needs a spring update. Did it survive?